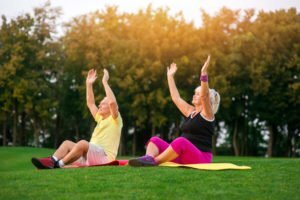 The benefits of exercise don’t diminish as we age, and it’s incredibly important for older adults to maintain as active a lifestyle as possible. Even those who are bedridden or wheelchair-bound have a full range of options available to strengthen, improve resistance and flexibility. The first step is always to check with the physician to get a recommendation on the best exercises for seniors that fit with your loved one’s activity level and medical history. Initially, exercising even for as little as a few minutes a day, repeated several times throughout the day, can greatly enhance the senior’s health and wellbeing. Resistance Exercises: To build and strengthen muscles, resistance exercises can be performed with elastic bands, available in a variety of tensile strengths. The Journal of Gerontology: Biological Sciences reports that even just one day per week of resistance training helps older adults maintain independence and reduce the risk of injuries. Flexibility Exercises: Stretching exercises help improve flexibility and freedom of movement. Check for yoga classes at local senior or recreation centers. Alzheimer’s Exercises: In the early stages of Alzheimer’s especially, a variety of exercise options are available, and with increasing supervision and some modifications, can be continued as the disease progresses. Since repetition is often a comfort to those with Alzheimer’s disease, activities such as walking, riding a stationary bicycle, and folding laundry are beneficial to both the person’s physical and mental state. Participate in an exercise program with the senior. It’s always more fun to exercise with a buddy. Set aside dedicated time each day specifically for exercise, and make it a priority. Designate incentives or rewards for achieving milestones. For more tips on helping older adults increase activity levels, contact Hired Hands Homecare. Our professional California in-home caregivers are experienced in helping seniors thrive and enhance their overall wellbeing, and we love nothing more than knowing the seniors in our care are healthy and enjoying life to the fullest! Call us at 866-940-4343 to learn more! My parents are almost 70+ and they don’t like to have exercises. But after reading your article, I think I should try once more. I will try to convince my parents to have exercises so they will keep themselves fit and I will be tension free.